Running a business is stressful enough on its own. The last thing you want to think about is gardening. Want to leave a lasting impression on your clients with an inviting outdoor space that offers peace, comfort and tranquillity? Put your business on the map with a professional landscaping service that saves you time and money. Dual Group provides landscaping services across Sydney for a range of commercial businesses. From start to finish, your project is managed by an experienced team who will ensure your project is completed on time and within budget. Keep your outdoor space healthy and looking fantastic all year round. Dual Group provide a range of landscaping services to cater to your business needs in Sydney. From acreage mowing to lawn care and garden maintenance; we have the labour and resources to complete from minor to major restoration work. Turf Laying – Natural and synthetic turf cut-to-size. Installed with starter fertiliser to encourage growth. Weed Control – Use of herbicides to control invasive weeds. Manual and mechanical solutions for larger infestations. Dual Group is committed to reducing the impact on the environment. All herbicides are applied based on control methods outlined by NSW legislation and EPA. This means only problem areas are treated without the risk of damaging the soil or surrounding plants. Our products are low-VOC to prevent the spread of harmful toxins. And applied discreetly to maintain productivity in the workplace. Dual Group is passionate about increasing the quality of life for residents across Sydney. From lawn care to property maintenance, our attention-to-detail ensures your property looks its absolute best. All gardeners are fully licensed with public liability and professional indemnity insurance. Give your commercial space the care and attention it deserves – without disrupting your business activities. Call 1300 303 539 or send your online enquiry to request an obligation-free site inspection with a licensed expert. 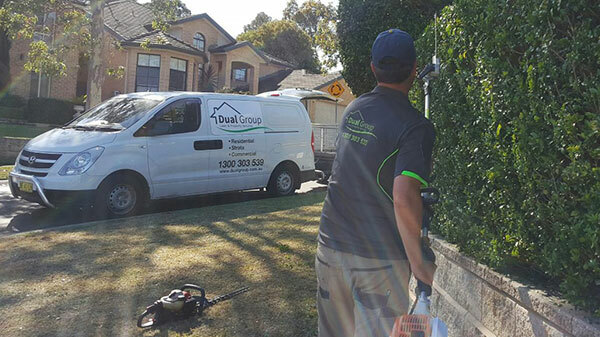 Dual Group are available for landscaping and property maintenance across Sydney.